The polar vortex brought an unusually cold and bitter winter that will not be forgotten. We are still feeling the effects of the harsh winter moving into the winter of 2014-2015. 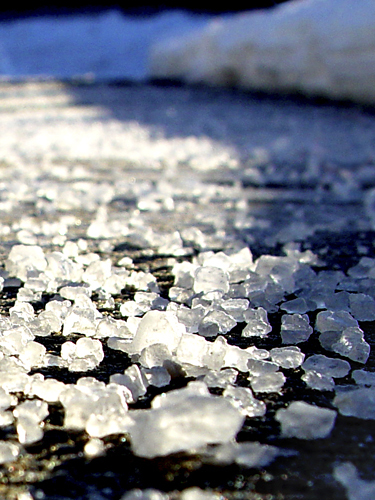 Salt is a hot commodity and valuable resource for combatting snow and ice. At the end of the 2013-2014 winter, it was difficult for many to get enough salt needed to treat their regions. This has left many buying salt even earlier than normal in preparation for the winter ahead. If you are planning ahead for next season by purchasing early you will also need to consider storage of the salt in the offseason. It is important to note that salt requires proper storage at all times. Salt can have damaging effects on the environment which has caused the government in each state to elicit specific salt storage requirements and fines if requirements are not met and the salt causes damage. Salt runoff can impact the environment in a multitude of different ways. It can contaminate human water supplies as it penetrates into water sources used for drinking purposes, such as wells. The population of fish, plants, frogs and other freshwater organisms can be harmed by salt runoff. Trees and plants nearby can also be affected when the salt spreads into ground water. This process dehydrates and kills the plants and animals nearby that rely on fresh water to live. These reasons are some of the outcomes that resulted in government fines for improper salt storage. While improper salt storage can have negative effects, proper salt storage can ensure you are ready to go when the next storm hits. Generally, most spreaders require dry, free flowing material to most effectively spread de-icers. Proper salt storage keeps salt fresh and moisture-free making it easier to load and spread the material. Improper salt storage can have damaging consequences for a snow plow contractor, but properly storing your salt ensures no fines or costs will be spent replanting grass or trees. Salt also has a unique property that if stored properly, it never loses its melting power. If there is left over salt from a previous year, proper salt storage can ensure the salt can be used the following year. Salt that is not properly covered can be lost with ground water costing you money. You should always store salt in a covered, waterproof storage facility as it is important the salt is protected from the elements. Salt that is exposed to precipitation becomes lumpy and difficult to spread. It is difficult to keep the salt completely covered with a tarp during rain or snow storms, so a fixed roof is most highly recommended. It is also equally important to take into consideration how big your salt storage facility needs to be. The amount of salt being stored is the first concern, the second concern is what type of vehicle are you using to load and transport the salt. Confirm that your vehicle will be able to transfer the salt safely and efficiently. Ensure there is proper drainage in the storage facility. The ground should allow any precipitation to flow away from the stockpile of salt but not into nearby sewer systems, groundwater, or freshwater areas. Concrete or asphalt are the recommended floors for a salt storage facility. Both materials can withstand the wear of loading, unloading, and storing an element like salt. There is no denying the importance of salt in battling snow and ice in the bitter winter months, so make sure you have enough salt supply and are storing it properly according to your state’s salt storage requirements. Check out the BOSS VBX Spreaders for your salt spreading needs this winter!